Monitoring the air in our home is an important step for healthy living and Awair has put together a compact, affordable starting point. In the right situation, it can be a helpful guide toward breathing easier. Our home’s air quality is something we should all be concerned with. Whether you have allergies, a newborn, or just want to make sure you’re at peak performance, it all starts with what we’re breathing in to our lungs. And while an air quality monitoring system might not be the coolest smart home gadget you can buy, it could be the most important. San Francisco based Awair is trying to not only make checking air quality in your home easy, but automate ways in which you can fix the problem. Their Awair Glow acts as a compact Wi-Fi enabled air monitor, night light, and smart plug in one. And at right around $100, it’s one of the most affordable options on the market today. Shaped like a plug-in Glade air freshener, the Awair Glow has a common white plastic body with an uncommon wood-grain touchpad on top. That’s right, the top is actually wood. I initially balked at seeing the wood, but in conjunction with the light that borders it on top, it’s really attractive and unique night light. A multicolor LED on top gives you the air quality conditions at a glance (green, yellow, red) as well. The body of the Glow features a 3-prong outlet, power button, and sensor that can activate whatever’s plugged into it when you enter the room. Altogether it hits all the buttons I look for in design. It’s attractive and functional. It even avoids blocking your second outlet. Getting the Awair Glow up and running was a cinch. While the written instructions require an electron microscope to read, the Awair app that is available on both iOS and Android does a terrific job in guiding you. After plugging in the monitor, you’ll connect it to your home’s Wifi (only on 2.4GHz for now). You’ll also need to make an Awair account which takes a couple minutes to setup. It was a rather painless experience. What I liked next after connecting the monitor was Awair’s desire to customize it to my needs. They want to know where in the home you’ll be placing it as well as why. Are allergies your biggest concern? Or are you planning to use this in a baby’s room? Your choice dictate how the app will interpret the data and what advice it will give to alleviate any issues. The Awair Glow tracks four specific data points in your home. Temperature, humidity, CO2, and the broad “chemicals” category (VOC). This data is tracked continuously and plotted out in a chart for you. Awair provides a score for the air quality and will send notifications to you when it feels there is an issue. These notifications can be customized to your needs in the app. Temperature and humidity are rather straightforward. While the temperature was accurate on the Glow, we did find the humidity readings to be a bit off. Regardless, both of these data points can be configured with a space heater or humidifier to trigger on or off when preset levels are reached. For instance, if the temperature in the room drops below 66 degrees, you can have it trigger on the heating device until it reaches the desired level. 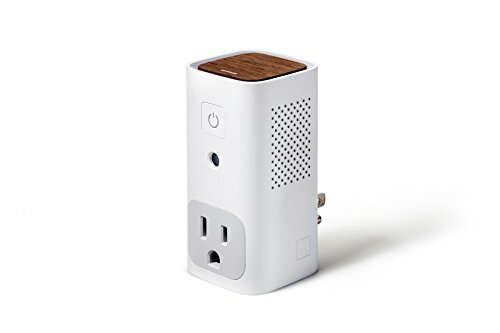 But beware, since the plug simply acts as a mechanical on/off switch for the plugged in device, you’ll need that heater or humidifier to also have a mechanical switch. Fancy digital space heaters won’t work. CO2 was the one data point I was most excited to see. Studies have shown that slightly higher levels of CO2 in the home can lead to drowsiness, headaches, poor attention span, and even increased heart rate. Newer homes are being built as air-tight as possible to keep energy costs down, and that tends to increase CO2 levels. The Awair Glow measures CO2 in ppm (parts per million) and I found myself slightly obsessed with the results. For the most part, my home fell within acceptable guidelines at around 600ppm (400ppm is what you’d find outside). But it did tick up over 1000ppm at times which is where negative side effects can occur. When this happened, I knew it was time to open a window, door, and turn on a fan. Usually within an hour the levels would drop down. Now I couldn’t tell you if this helped me in any way, but I figure it couldn’t hurt and at worst was a reminder to get some fresh air flowing in the home. As helpful as the CO2 levels were, the “chemicals” are just too vague to mean much. Awair has what they consider acceptable levels and will notify you when VOC (volatile organic compounds) reach a certain point. Unfortunately, it doesn’t tell you the source and doesn’t offer up much in the way of fixing it. For instance, two days into using the Awair Glow I received notification of higher levels of chemicals (they’re measured in ppb or parts-per-billion) in the house. Now this could have been from some cooking I had done an hour earlier. It could have come from a scented candle I had lit in the bathroom. Perhaps some Febreeze I sprayed or a permanent marker I was using. The data offers little guidance into determining the source and you’re left opening a window, turning on an air purifier, and guessing. Now this doesn’t make this aspect of the Glow worthless. It is good to know when higher levels of VOCs are present. And being able to hook up an air purifier to go on when levels reach a certain point is a great feature (and what I’m doing in the bedroom with the Glow). Prolonged exposure to VOCs can lead to some nasty health effects like headaches, eye irritation, skin reactions, fatigue, and more. But without knowing what’s causing it or how to fix it, you can be left feeling a bit paranoid. No smart home product would be complete without integration with today’s popular smart assistants. The Awair Glow works with both Amazon Alexa and Google Home to provide a number of voice commands. You can ask for specifics like the CO2 levels or temperature (“Alexa, what are the CO2 levels?”). You can have it turn on the device that is plugged into the Glow (you can even give it a custom name like “Bedroom fan”). Or you can turn on and off the night light. Unfortunately the one area I think the Awair Glow could be most useful is integrated with popular smart thermostats like Nest or Ecobee. It’d be great to have the HVAC fan turn on when it notices high levels of VOC in a room. Or to have the plugged in device turn off when my Nest thermostat goes into away mode. The folks at Awair have stated that this is a feature they’ll be looking to add in the future. I don’t think an air quality monitor is a must-have in a home. Especially since they aren’t detailed enough. As long as we don’t go crazy on the chemicals and throw open a window from time to time, we’re likely fine. But the Awair Glow grew on me over time and definitely seems like a product that could be beneficial in the right situation. A baby’s room is the first thought that came to my mind when I started using it. Being able to monitor the temperature, humidity, CO2 levels, and chemicals for $100 in the room that my child sleeps in would give me great peace of mind. Especially if I could hook up an air purifier to go on automatically when VOC levels get too high. I think it could be beneficial to those with allergies or respiratory issues. Or those who find themselves inside a lot. Overall Awair has built an affordable air quality monitor that has some nice added features like a nightlight and built-in smart plug. It has an attractive design and is fairly inconspicuous too. Sure I could just open my windows more often. But I’m forgetful and for $100 I think it’s worth seeing what’s going on in the air in my home.